First soaking the rice noodles in cold water for 20 minutes and at the same time put a pot of water to boil on the stove. Once the water is boiling, blanch the noodles in the boiling water then immediately rinse under cold water and strain. This will help to keep the noodles bouncy and springy. Prepare a bowl of water with ice cubes and keep on the side. Then blanch the spring onion for a short while only in the same hot water. Remove and soak them in ice water and drain. Place them on a kitchen paper towel to absorb the water. Chop and mix the spring onion with the tuna. 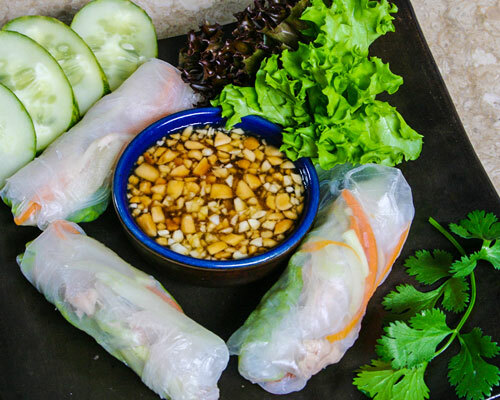 Take two sheets of rice paper at a time and lay it flat on a big plate or tray. Sprinkle with water using your fingers and once the rice paper has softened, place a piece of lettuce on one side of the paper nearest to us. Put a piece of Ayam Brand tuna on the lettuce, following here by a small clump of noodle, some cucumber and carrot shreds on top. Then fold the bottom paper and over the filling, fold in the right and left sides. Roll the wrapper so that it is 2/3 rolled. It will come easy with a bit of practice. You can place a strip of spring onion as well to make it a handle. Place coriander leaf on top of the roll: this will appear like a little design on the finished roll. Roll again until the edges are sealed. Place the finished roll on a plate and cover with damp towel. To make the peanut sauce, combine all the ingredients (1/2 cup water, hoi sin sauce, sugar, peanuts, garlic) until well mixed. Roast the peanuts to give extra flavors if you like. Decorate a big plate with cucumber, carrot, fresh coriander and lettuce leaves. Place our peanut sauce in Chinese spoons and place spring rolls on top of the spoons. Put now these spoons on the decorated plate. Comments: This convenient and quick low calorie recipe is a source of lean protein, dietary fiber & Vitamin C . It also contributes healthy fats – omega 3 fatty acids from Ayam brand canned tuna added to the recipe that contribute to good heart health by decreasing blood triglyceride levels, slowing the buildup of plaques that contribute to the "hardening of the arteries," lowering blood pressure slightly, and reducing the risk of abnormal heart rhythms that can lead to sudden death.